A colorful stack of frosted sea glass makes for a playful statement necklace. A hand-hammered sterling silver ring encircles a stack of sea glass in Lisa Ronay's Orbit necklace. 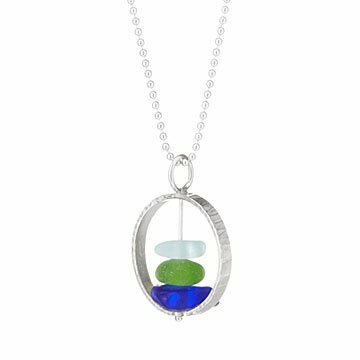 Viewed with a childlike eye, the pieces of blue and green sea glass might even remind you of a certain roll of colorful candy–a fitting thought, given that sea glass is shaped and frosted by its years in the ocean. Though these glass shapes are neither buoyant nor edible, wearing this necklace will undoubtedly add a playful, whimsical element to your look. Handmade in Oregon. The tri color sea glass is eye catching without being overdone. Very good quality and craftsmanship for the money. This is my second review because I bought this twice! I use this necklace to perk up what I'm wearing. I DID buy this item again! Bright and pretty hammered silver design, good quality, with delicate natural seaglass and a perfect 18" length chain -- love it! I love this pendent necklace. I love the design and craftsmanship. I can wear it anywhere. It's versatile enough to wear every day--chores, work--and when I want to dress up for the evening or special occasion. Only thing negative about this necklace is that the chain is a bit short for my thick neck. I can fix that.